The identification for the Amidon toroids consists of one or two letters (T=toroid and FT=ferrite toroid), followed by a number (for ex. T50), which represents the outer diameter dimension expressed in 0,1 inches, followed by a separation mark (dash, dot, stroke), followed by another number indicating the frequency mixture and the frequency range at which it would be recommended to use the toroid. It should be taken in account that a toroid with a X declared frequency will be able to operate with fairly good performances even at 10 times higher frequencies and only the A factor will decrease. The iron powder toroids are colored according to their mixture; the first color covers three sides and the second color the remaining side. AL is a value indicated from the manufacturer and it differs from core to core;it indicates the mh value for 100 turns (T series). 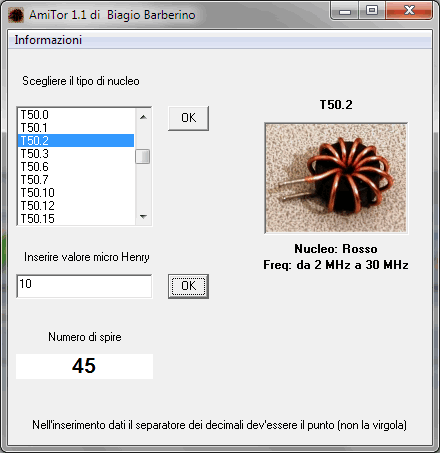 The freeware program Amitor 1.1 written inVisual Basic 6 enables to determine the number of turns required to produce coils without using any formulas or tables; it will be only required to know the Amidon core identification. It should be kept in to consideration that information provided in this program make it possible to realize toroids for small signals. When used in circuits like big switching feeders, RF high power tuners, linear amplifiers over 20 Watts etc, use of a large diameter wire is required (taking also in to consideration the maximum number of turns allowed), and it will also be important to know the intrinsic features of the core to be used. These information can be detected from the manufacturer’s site downloading the appropriate data sheet. The data sheet will provide the L value equivalent to N=1000 turns, or N=100 turns (with current I imposed), and the material magnetization curve B/H. The saturation percentage expected for the calculated H can be detected on the magnetization curve. You should also consider that µ (permeability) may change sensibly depending on the increase of the current flowing through the wire, that is according to the H magnetic field imposed for the core. My site has been removed from the web. A new version of Amitor in English and Italian Language will be presented soon. Please be patient and periodically check the url above. Agradeço desde já sua prestimosa atenção.